What’s a mother to do when her 12-year-old son has a passion for long hair and lovely dresses? If she’s surrealist artist Margo Selski, she lets him pose as the subject of her fantastical paintings in the exhibition “Hitherto and Henceforth,” which runs through June 30 at West Hollywood’s Glass Garage Fine Art Gallery. Also painting an unpleasant picture of her son Theo’s torment in their small town of Ellensburg, Wash., Selski explains how she always colors on the right side of the line between empowerment and exploitation. The Advocate: Tell me about the inspiration behind the paintings in “Hitherto and Henceforth” that feature your son Theo. 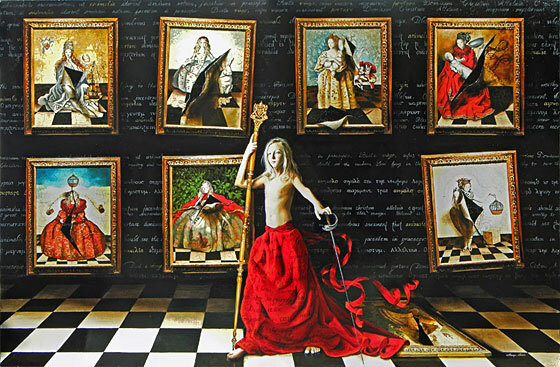 Margo Selski: This series of paintings was intended as a celebration of balancing between two things. They’re neither entirely classical nor entirely contemporary, neither entirely realistic nor entirely fantastical, neither entirely familiar nor entirely alien. That balancing point between old and new, comfortable and uncomfortable, safe and unsafe is what this exhibition is all about. Theo is himself on a balancing point. On the one hand, he is an athletic, rambunctious kid who loves to roughhouse, play basketball, play noisy video games, go camping, and spend half the day on his heelies — those shoes with wheels in the heels. On the other hand, he is gentle and loves beautiful, fine things, and loves dressing up as fantastical figures, both male and female, to pose for my paintings. Thus Theo is balanced between two extremes himself. However, he has also recently turned 12. Everything changes at 12. Your body changes, your voice changes, your peers change, your world changes. The world begins to pressure you to be one thing or another. You’re balanced not only between being a child and becoming an adult, but you’re faced with choosing an identity in the social system you live in. This series of paintings is intended thus as a larger portrait of the kind of choices that nature and society place before us at the difficult age of 12. What’s the significance of the dramatic royal fantasy scenarios in which you’ve imagined Theo? The royalist imagery has to do with power. The figures that Theo portrays in these paintings have the sort of confidence and power that children are drawn to. Theo is shy and quiet. The royalist imagery is a normal reaction to counter that. One might argue that there’s a fine line between empowerment and exploitation. How do you respond to critics who might say that this exhibit is exploiting Theo — in part because, at 12, he’s too young to make an informed decision about being your subject? This is a very important question. Theo has, since a very young age, been drawn to my paintings and wanted to “star” in them. My paintings have always represented to him a beautiful alternate reality. I of course adamantly will not tell him that his desire to be in those paintings is wrong. However, the decision to allow him his desires was made by his father and me, not by Theo. We have seen the benefit of a positive visualization of Theo’s own attraction to another imagined world filled with lush beauty, mystery, and power. The paintings have proven to be enormously positive exercises in letting him share, in a very visual way, his inner world. Starring in the paintings allows him to see himself portrayed with the kind of confidence and power that he, and every kid, hopes to have someday. I understand that Theo has toyed with cross-dressing since he was 7 years old. How do you view Theo’s periodic penchant for long hair and traditionally feminine fashions? Theo is really more androgynous than he is feminine. Like I said, in many ways he’s a typical rambunctious boy. His fine features and long hair came across to people in Los Angeles as more “surfer dude” than feminine. All children start out fairly androgynous. Each child picks up cues from the world and decides when to get off the androgyny train, and the age of 12 seems like a pretty universal stop where kids get off that train and go in one direction or another. There is a natural affinity between Theo’s androgyny and the historical references in my paintings. Throughout most of Western history, the most powerful men in any Western nation have worn long hair or wigs, fine fabrics, feathers, jewelry, and tight-fitting pants that showed off their legs. The references remind us that the strict gender categories in our own time are a historical anomaly. Have you and your husband always responded so positively to Theo’s androgyny? My husband has been enormously accepting and supportive of Theo’s reluctance to conform to strict notions of what boys and girls are allowed to do. On paper, Theo’s world is very different from the one that my husband and I grew up in, in small-town Kentucky. But Theo is also our oldest child. I think every parent would report that your first child turns your life, your viewpoints, and your values upside down. We just folded Theo’s refusal to fit neatly into one category or another into the general flexibility that having a child requires of a parent. Your first child makes you have to recalibrate your understanding of reality. Theo required us to realize and accept that in the larger world there are people like Lady Gaga, Zac Efron, and Ellen DeGeneres, who challenge traditional notions of what is masculine and feminine. In recent months we’ve seen the mother who wrote a children’s book in support of her so-called Princess Boy, and we’ve also seen the mother who painted her 5-year-old son’s toenails pink in a J. Crew catalog. Numerous news outlets picked up these stories, and various pundits questioned whether or not those mothers were actually encouraging gender confusion. I think that if you meet the children, such as Theo, you realize that there is no “encouraging” going on. Androgyny is a natural state in children, and it is society that purges that out of them. Theo’s father and I are simply refusing to enforce that purge on our son. How is Theo treated in your hometown of Ellensburg, Wash., and how does he respond to harassment from his peers? Theo understands that our small town is probably not as familiar with the kind of changes that have occurred in the larger world in notions of what is masculine and feminine. Theo knows that his androgyny will be misread in our town as femininity, being gay, or being weak. Theo understands that unless he wants to be constantly misunderstood by the limited world that he lives in, and unless he wants to take on the challenge of educating everyone around him about the changes in the larger world, he will have to edit himself. Theo recently cut his hair in an effort to go a little more incognito. However, young kids are wired to sniff out difference. Theo’s essence is just fundamentally different from other kids’. Even if he did not look androgynous, Theo will always be different. I hear that his harassment came to a head recently when Theo got a black eye from a former friend. How is this situation being handled, and what can be done to keep Theo safe from bullies until he’s out of high school? We have been dealing aggressively with school administrators and the parents of the child who attacked Theo. If need be, we will get help from law enforcement to keep Theo safe. The issue of keeping children safe from violence is larger than Theo’s own differences from his peers. Plenty of kids who are not androgynous are bullied. Schools and parents all need to be a whole lot more involved in preventing bullying from happening. Theo has also asked to take self-defense classes, partly so that he can feel confident that he can defend himself if he is ever in a situation where he needs to, but also partly because he loves kung fu movies. As I said, Theo might like beautiful things, but in some ways he’s very much a typical boy. No mother wants her child to be bullied or to have a difficult childhood. Have you or your husband ever encouraged Theo to suppress his impulses and dress like the other boys in order to spare him harassment? This is a very difficult balancing act. Do you knock down your child’s natural impulses, or do you let the world knock him down? My husband and I decided that the important thing to do was to not purge Theo’s desires but to prepare him fully for the idea that his peers would react with a hostile reaction to his choices. I think it is a mistake for parents to try to micromanage their children from afar. Helicopter parenting is just not possible. You can’t be there all the time, and you can’t be controlling your child’s every mannerism and comment. Further, the semiotics of teen culture are generally treacherous territory for a parent to try to legislate in their child. We encouraged Theo to find some sort of “style identity” that would allow him to express his love of beautiful, fine things, but also not invite misinterpretation and bullying. I think of the goth-steampunk-alternative kids in L.A. that we met through Henry Lien, owner of Glass Garage. These boys wore makeup and dressed outrageously, but they somehow got away with it and were actually seen as cool and a little intimidating. People did not mess with them. However, Ellensburg is probably not sophisticated enough to support that sort of sophisticated subcultural reference. Kids here will probably react to anything different with hostility, and we are making sure that Theo understands that. Although it seems premature — and correct me if I’m wrong — to put any labels on Theo that sexualize him, have you responded to his behavior by educating him on gay and trans issues? You are absolutely correct. Gender identity and sexual identity are two very different things. The fact that he might be androgynous in his identity doesn’t necessarily mean that he doesn’t feel like a boy inside or that he is gay. But we have introduced him to different people. My gallerist Henry Lien is openly gay and sort of serves as the proverbial “gay uncle” for Theo if he has any questions. Through our visits to L.A., Theo has met many gay and lesbian people as well as many outrageous and creative straight people. We are working very hard to give Theo opportunities to be exposed to views into diverse lives, but stepping back and letting him find his identity on his own, in his own time. You took Theo to L.A. for the exhibit’s opening, which he attended in a beautiful red velvet gown, pearls, and black lace opera gloves. What was that experience like for him? The opening exhibition was like Theo’s opening concert of his world tour as a rock star. Los Angeles is a lifeline for Theo. It is his Oz.